I myself still have alot of animes on my to-watch list. I'm currently watching the first FullMetal Alchemist, and I'll proceed with Brotherhood after that. After that, I'm going to watch To Aru Majatsu No Index and then I'll see what happens hee hee :3 I'm pretty busy most of the time because of school and work so I take my time. I suppose we should start this off with explaining our places in regards to both. I love Anime and Manga, and usually when I'm making RPs, I always picture it in the same style as Anime and Manga. I honestly wish that the novel I'm working on would be made into a Manga series. In terms of my Anime list... I will admit I haven't watched alot of Anime recently. Mostly because I just haven't had the time to focus on watching an anime from beginning to end. But what I have watched is as followed. And more will probably be added as time passes. By the way Jest, There IS NO DB GT . Just saying. Ah, anime. My life, my love. Partially. I've seen a lot of anime in my life, but I've probably read more manga. Of course, those were the only ones I've watched recently which I can review favorably/remember. On the manga front, I've read a bunch of minor ones back in my days of clicking the "Random" button on a manga reader website, and many of the anime I've seen I've read the manga of first. There are also two other media you should be aware of: The Novels Light and Visual. and finally, one of my personal favorite light novels, Utsuro no Hako to Zero no Maria. Saya no Uta, an insane game with Gen Urobuchi (probably most well-known for Puella Magi Madoka Magica) as the writer. There were also some western, but nevertheless eastern-styled visual novels: Digital: A Love Story, Analogue: A Hate Story, "don't take it personally, babe, it just ain't your story." It'd be foolish not to include the famous 4chan visual novel, Katawa Shoujo, which is of surpassing quality despite what some might expect. Dischan has developed a demo of Cradle Song, which I'd like to play once it's out. So that's basically my immediate experience with Japanese literature and such. Ah yes, katawa shoujo. This was a surprise like none other, coming from what everyone was used to call, the backalley of internet... it had probably the most respectful recreation of disabled people I have ever seen in a video game. And I know there aren't many. They had feeling, they were all that lovable, and it gave you the need to go on with their own storyline. I just finished watching all, and I do mean ALL, of the Megaman NT Warrior, Megaman NT Warrior Axess, Rockman EXE Stream, Rockman EXE Beast and Rockman EXE beast+ episodes. Only Megaman NT Warrior and Megaman NT Warrior Axess were in English, with the other three being in Japanese and only about half of those having English subtitles. After about a month of watching it all I'm now used to watching shows in a language that I can't really understand. On that topic, I now know how to say 'sword' in Japanese. It's amazing how many words you can pick up in Japanese, given there are subtitles and the use the word in many different cases. Probably the fact that If a word is used Several time, One might get His signification. Learning is always great. Mangas, not much but I've read Full Moon O SagaPoope, Q.Ko-Chan, Yotsuba&!, Fruits Basket (it's alot longer than the anime so...), Kitchen Princess, and Yu-Gi-Oh! R.
Welp. To bring new life to this thread, let's start a discussion yay! 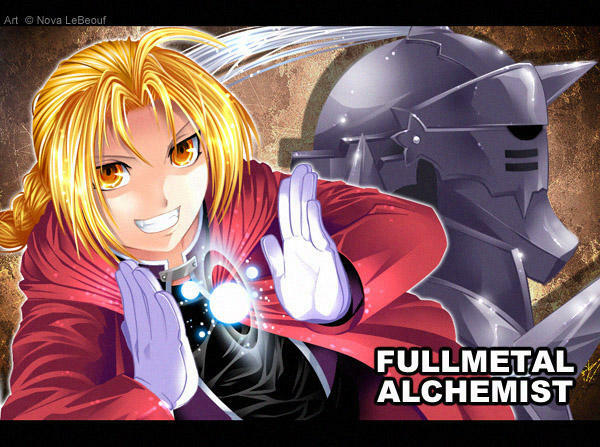 Actually, I finished Fullmetal Alchemist Brotherhood today and this is, by far, my favourite anime of all time. The story was amazing. It was deep, emotional and at some points hilarious (referring to Ed's shortness). It could easily change the point of view for several people on subjects like life itself though, so I wouldn't advise it to kiddies. The intro's and endings were amazing. Not only did they have great music, but they also tell the plot and what's going to happen in the coming episodes. The characters themselves were my favourite part. Mainly because literally EVERY character had a purpose within the story. If one would be missing, the entire plot could change. Even silly Yoki had his important moments. And the personality of most characters were great too, to the point where you become sad and tears roll out of your eyes because they turn out to be dead or missing in any way. I loved this anime, I could easily watch it again and again and again... But I don't have any time for that due to me always being busy. I've heard good things about FMA, I have got to check it out sometimes. I finished Rewrite after about 6 months of playing. It was definitely one of the best visual novels I've ever played, but what do you expect from a Key work with collaboration from 7th Expansion and Type-Moon? It's like Visual Novel All-Stars: Melee. Have you all checked out this season's shows? It's pretty awesome. Samurai Flamenco shows potential. Golden Time is a romantic comedy, but the characters are actually realistic subversions of popular tropes. Banri has amnesia, which is a typical excuse to explain why he has no social relations, and so you'll know as much as he does; however, he actually has to deal with his past in a non-cliche way. The yandere stalker actually has character depth, and the poor target of her stalking, Mitsuo, actually has his own personality problems. It's a nice refresher to see characters make logical decisions and be driven by actual human desires instead of the extremely unnatural conversations in most romantic comedies. Kill la Kill is, depending on who you are, either extremely shallow fanservice or extremely deep fanservice. Coppelion is great, but it could be better. It may improve. Unfortunately, I haven't watched any of those, I'm still kind of a 'newbie' when it comes to anime, only having watched the most famous anime or the most childhood like. For example Pokemon, Hamtaro, DBZ and FMA. I do plan on getting more into anime if time allows me to. Next on my list might be Sword Art Online, due to it being only 25 episodes long so I'll be able to watch it easily. I heard some negative reactions on the anime but on the other hand, I heard some pretty positive too. So I guess I'll just have to see for myself. To aru Majatsu no Index/Kagaku no Railgun is also on my to watch list, but is a bit longer so I might consider that one for winter/summer break. I think I complained about it earlier, but the light novels are better, although now you can probably only find the first 3 volumes for free on p2p networks because of their recent licensing in the U.S(!). The anime is also very good, and it's actually a pretty good representation of the anime scene at this time, both the good parts and bad. Also, unless you're talking about the very popular and old anime, it's actually pretty rare to see an anime have more than 26 episodes (one season). Heck, even Puella Magi Madoka Magica had half a season, so in anime, 25 episodes is not really considered short, though SAO will probably get at least one more season. Good luck watching it, tell us how you like it. Well, there we go, I finished SAO. And I must say, I'm far from dissapointed. And my second favorite song also comes from this anime. Well, rather said the nightcore version, but I still love the original too. In the meantime, I have finished 2 more anime. And most of you know which ones I'm talking about: To aru Majutsu no Index and To Aru Kagaku no Railgun. First off, Index. I really enjoyed watching it but I can't deny some flaws it has, roaming from connections in story and some of the characters not having enough introduction. I'm trying to keep it as spoiler free as possible, but I can't guarantee. The anime is split up in different arcs. The problem I think it has here is that they move on to a new arc with the old one being partly finished but leaving some open questions. Probably this is better worked out in the manga or eventually a third season (I'm expecting it to happen due to an open end). Second point, the characters not having enough introduction. There is this guy who tells you he is part of something, boom episode ends. All fine and everything but I didn't know enough about the person in case to actually care. Aside from those two points, I can rank this as a pretty solid anime worth watching. 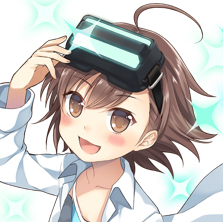 Second, Railgun. At first I had a kind of mixed opinion after watching the openings. Mechs, ''aliens'' (that was what I imagined, but was false fortunately), those just don't have any interest to me. Fortunately I was wrong on both of those cases. Railgun turned out far better then I could have ever expected. I also consider it better than the original, despite it not having Last Order. The arcs were far better connected, resulting into a more fluently and overall more interesting story. The characters were also far more loveable, though still having slightly less but still present issue of not enough introduction. And the ending was absolutely fenominal. It doesn't really matter which of the anime you watch first, though you might miss some references if you watch Railgun S (second season of railgun) first. But I would definitely recommend this anime. the animes i seen: Shakugan no shana:Action, fantasy, romance. Kore wa zombe:comedy,harem,fantasy. its really funny XD. and attack on titan:its really dark really really Dark. Naruto Shippuden "I only follow manga"
Some of Pokemon XY but i lost interest in it cause nothing but Pokemons change. I don't have any Going-to watch anime for now. I guess I'm still new to animes. ShaDuck1: I assume you've also seen or played Danganronpa, judging by your signature? Fwiss: yes i seen the anime,i like it. Well, a new season begins again. Any shows you guys are looking forward to (For the record, you can check out anichart.net/spring or neregate.com/blog/2014/01/15/spring-2014-anime/) ? Atelier Escha & Logy ~Tasogare no Sora no Renkinjutsushi~ Probably has the most interest for me. Alchemy, world is coming to an end, you name it and I might like it. Hitsugi no Chaika Has an interesting cover photo, but I'll have to look into it more. But it caught my interest nonetheless. Mahou Shoujo Taisen Will probably be an instant watch for me. Seikoku no Dragonar also looks pretty interesting. That's it I guess :3 At least, those are the most interesting looking ones which I will give a try most likely. So I finally watched an anime other than Sonic X. Ghost in the Shell: Stand Alone Complex. Yeah, I know it's almost twenty years old, but I thought it was a great show. I suspect it is probibly very low-key compared to some animes, given it's more of a cyberpunk police procedural show, and not very action intense. And what action there is tends to be, again, low-key.